The platoon weeps with joy at Keroro’s latest invasion plan and its 200% success rate. 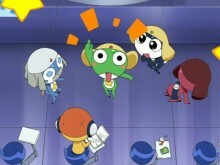 However, Keroro is clearly not himself. While doing the dishes with Natsumi, he falls off the stool. 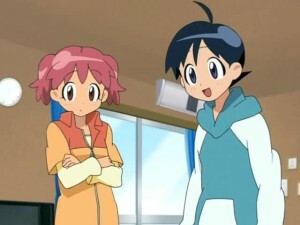 Natsumi saves the glass and starts to scold him, but sees hes thinner than normal. 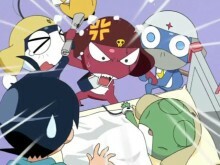 Keroro goes to fill the bath, where Fuyuki finds him passed out in the water. Seeing he’s really very ill, Mois is about to destroy the Earth until Dororo knocks her out. Giroro goes to find a Space Cerberus liver, but the price of them has risen to heights he can no longer afford. Fuyuki scours the town looking for that special Gunpla model Keroro wanted. Keroro continues to get worse when Aki comes home. She has Keroro open his mouth, then she feeds him a star fruit, known as Gorenshiki. The fruit causes Keroro to revive. Kururu investigates and discovers the fruit has Keron nutrients in it. 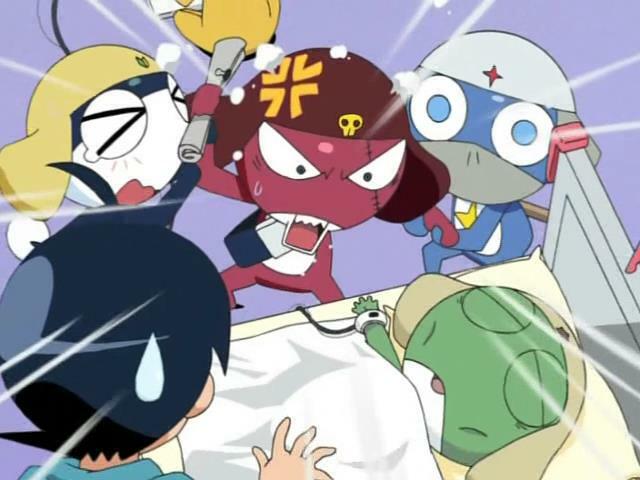 Aki figures out that Keroro’s disease was actually him being homesick, causing Giroro to be frustrated that their great plan can no longer be executed. 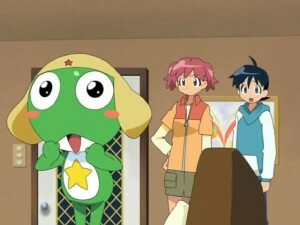 Keroro has already done all his chores before Natsumi can tell him, something he attributes to eating star fruit. Sadly, he has consumed the last of his star fruit and the shock of it causes him to collapse on the kitchen floor. Natsumi suggests buying more, so Keroro dons a Pekopon suit to go to the supermarket to buy some. He discovers a single star fruit costs ¥850, which he then translates into what kind of Gunpla he could buy instead. 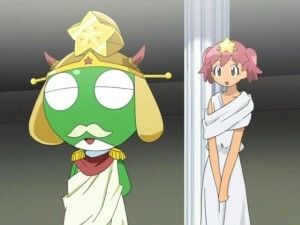 Frustrated, Keroro returns home with a new plan involving star fruit. 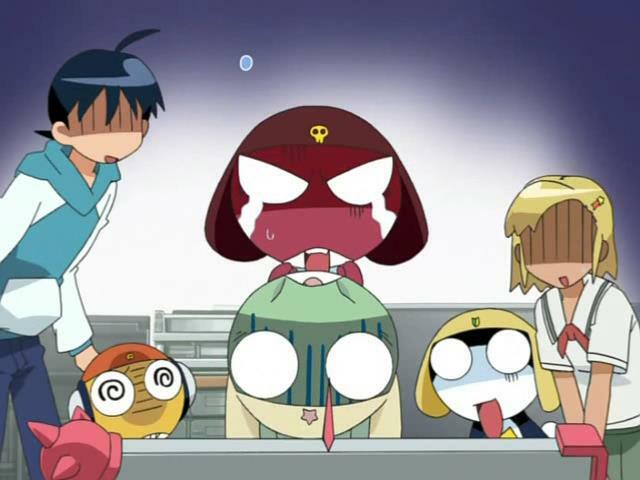 Kururu gives it a 1500% chance of success and Giroro marvels at how he underestimated Keroro. Soon, their plan is in action and star fruits are everywhere.. With the success, Keroro suddenly finds himself ruling Earth, but when Fuyuki brings him new Gunpla, Keroro is dismayed that they’ve all turned into star fruit. 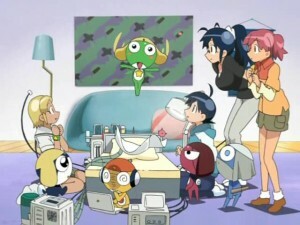 Keroro wakes up on the kitchen floor and rushes to the TV where Gundam appears as normal. Keroro turns down Natsumi’s offer to buy him star fruit, saying he doesn’t want to overdo things, something Natsumi finds as intelligent. We had the usual two story format here, but this time, the two stories were linked in such a way as to be a continuous thing, which I actually prefer. The first story with Keroro being gravely ill was pretty much by the numbers. 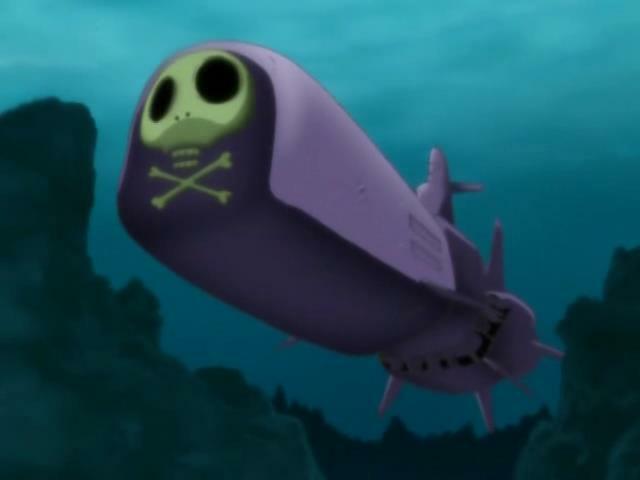 I did chuckle at how Dororo had to knock out Mois to keep her from destroying the Earth when things looked bad for Keroro. I liked the continuity element with the Space Cerberus liver, which came up in episode 50. I normally don’t speak of music for this series, but it was used effectively here. The Hallelujah Chorus from Handel’s Messiah playing as Keroro revived may have been cliched, but I didn’t expect it, so it was funny to me. Then, there was a parody version of The Imperial March from The Empire Strikes Back, which made me smile. Overall, a rather fun episode, though nothing special.